Story : The legend says a crow takes the soul of people to the land of death, but sometimes it gives them power to rise from their grave and right the wrong that has been done to them. 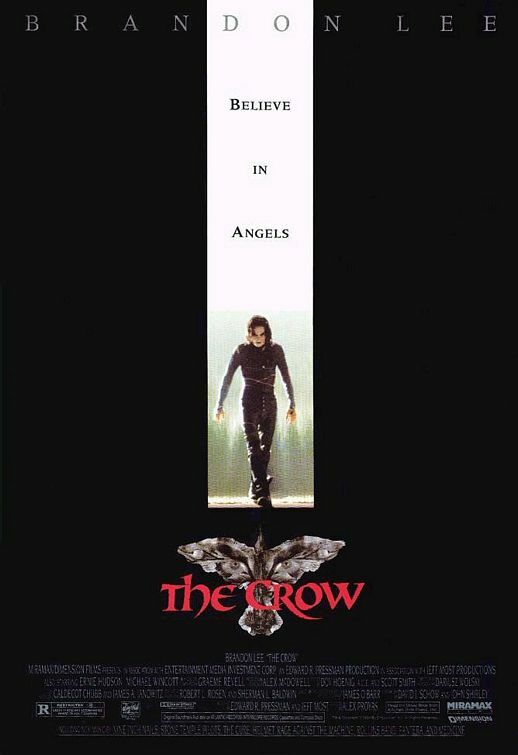 Eric Draven and his fiancé Shelley, were brutally murdered on the Devil’s night, the same they one year later Eric comes back to avenge his killers. – I don’t think there is anybody that’s not biased by this movie. It’s the last movie of Brandon Lee (Bruce Lee’s son), and you can’t help but overcome by sadness while watching it. There were scenes when I looked at him and started thinking he didn’t knew he was going to die, and this somehow with the tone and theme of the movie creates an even more tragic vibe. – the crow, man if I was a crow girl I would have fallen head of heel for him. Now seriously, I hate birds from the bottom of my heart and I have the biggest fear of doves imaginable, they are just the spawn of evil and one day they will rule the world, you’ll see or your grand-grand-grand-grandson/daughter will, because I will leave this prophecy behind. Yes, that is how much I hate birds, sole reason why Birds from Hitchcock is the most challenging movie for me, I have the dvd for like 7 years now, I can’t even look at it, it’s just hidden in my room. But this crow, and crows in general have something about them. Just ask Poe (ok, it’s raven, not crow, but they are very similar). So Magic (the crow’s name, only one of the crows, but I like to think he was the only one, it was used for the oncoming sequels too) is a truly remarkable bird with beautiful gorgeous eyes that pierces in your soul. It does. – now that you heard all my craziness, I should talk a little about the movie itself. It is good despite being bad. The story has so many corny elements it’s a huge surprise they managed to put the same amount of kickassery scenes too. I remember when it came out, the whole school was buzzing about how brutal and scary is, I don’t know how I even forgot about it until now. Watching it I couldn’t help but laugh at me because I knew I would have loved this in teen years. It has all the textbook elements : brutal death, good police officer who is persecuted for his big mouth, deranged bad guys, a little girl that lost her friends – drug addict mom, of course – who needs to be saved, eternal love and so on. – Brandon Lee, it’s the only movie I have seen with him, I think he did a good job, many say Oscar worthy, but let’s not go that far. I believe he would have had a great career ahead of him because he showed promise. And yes I can’t help but think about the curse, but no need to talk about it. – it may be just for a few generations, but this movie becomes just a tad bit personal, it will always remain my gothic tale of true love. – almost forget, best music ever in movie. What can I say, once a rocker always a rocker. – it’s corny, It’s 90’s all right, you can even smell it in the air when the movie starts. -and that is just a personal issue, but I couldn’t take my eyes off Bai Ling incredibly disgustingly drawn lips. So glad it’s not a trend anymore. – Draven first enters the apartment after digging himself out of his grave: footage of Lee walking through an alley in the rain was digitally composited into the scene where he walks through the doorway. Computer technology added drops of water to the door frame to make the water on his back not seem out of place. – The shot of Draven falling from the window was made by digitally compositing Lee’s face (complete with simulated blood) onto a body double. – The scene where Draven puts on his make-up was filmed using a double. The face in the smashed mirror was Lee’s, computer-altered to fit the shards. The image of Draven walking towards the window with the crow on his shoulder was a double with Lee’s face added during lightning flashes. – When Sarah visits the apartment, we never see Draven’s face as it is a double. -During the boardroom shootout, Draven rolls onto his back to kick a shooter through a window, then nips back up to his feet in one movement: a similar move to one performed in Enter the Dragon – which, coincidentally, was his father Bruce Lee’s last film before an untimely death. – According to Jon Polito, Lee cut himself when he broke the glass in Gideon’s shop. The glass was breakaway glass and it is very rare for anyone to get cut by it. Polito says that he told Lee that he feared Lee would die in an on-set accident like Vic Morrow did during filming of Twilight Zone: The Movie. I have seen two movies that featured an actor that died shortly before the movie was ultimately released. One of them was Batman & Robin (Great example, I know). That movie was the last project of Robert “Jeep” Swenson, who played Bane. The other one was Gridlock’d, where Tupac Shakur was murdered about 4 months before the movie hit theaters. well the most obvious example would be Bruce Lee, he died 3 weeks before the premier.Sadly there are plenty of other examples, John Candy – just a few scenes left; Aaliyah- plane crash after finishing principal photography; Natalie Wood- few scenes left, if I remember it correctly; Jean Harlow- around 90% of the film done; no more comes to mind.